First time after the successful performance at the 15th Bharat Rang Mahotsav in New Delhi, India, ‘Dhawala Bheeshana’, Dharmasiri Bandaranayake acclaimed theatrical production will go on the boards at Lionel Wendt theatre today February 16 at 6.46 pm on. 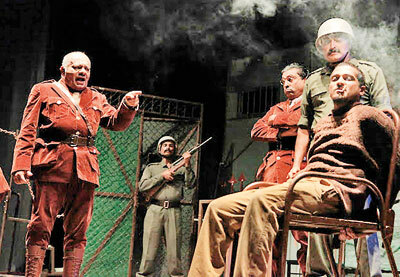 The play was well received in India both in New Delhi and at the Rabhindramanch Theatre in Jaipur. On an invitation by the National School of Drama in India, Bharat Rang Mahotsav, ‘Dhawala Bheeshana’ group consisting nearly 20 members flew to India last month. This is also the first time the play is staged at the Lionel Wendt after their opening on September 1, 2012.�‘Dhawala Bheeshana’ Sinhalese translation of the play ‘Men without Shadows’ by French playwright Jean-Paul Sartre was originally produced in year 1988. The translation was done by Ciril C Perera and music direction was by late Dr. Premasiri Kemadasa. The play won nine awards including Best Director, Best Actress, Best Set Designing and Best Lighting at the State Drama Festival in year 1989. It has been staged over 1000 times since 1988 and the new production has been staged nearly 30 times, since September 2012.